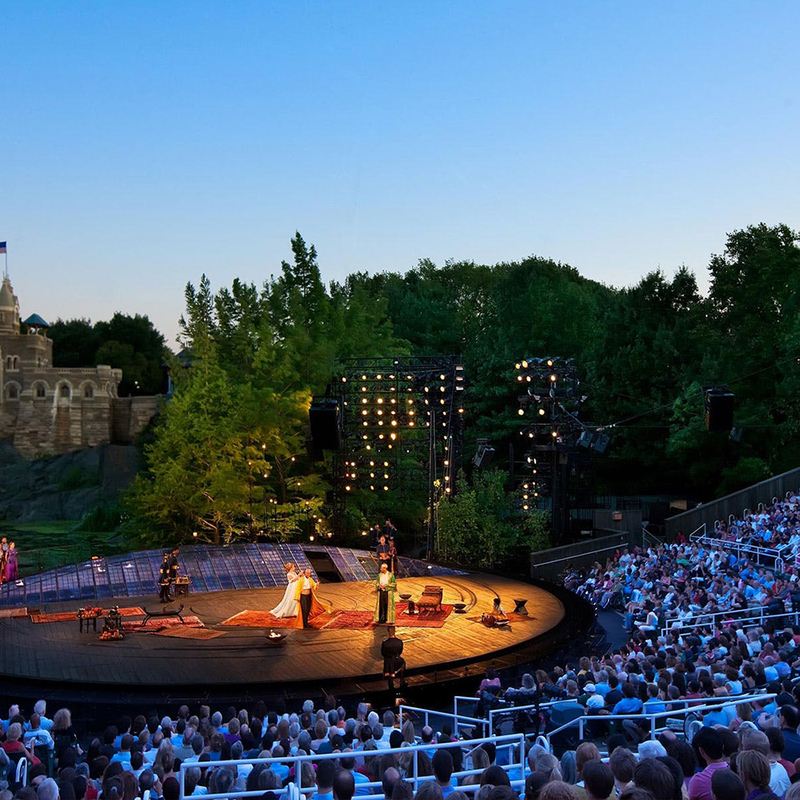 Shakespeare basically wrote A Midsummer Night’s Dream to be performed outside, and the Delacorte Theater in Central Park is the ideal venue for the comedy of magic and mistaken identities. You can almost imagine that Belvedere Castle off in the distance is the kingdom of Theseus and Hippolyta, and even the Central Park raccoon is right at home in the play’s woodland forest setting. So it’s no surprise that the Public Theater is bringing back the comedy this summer, making it the fourth consecutive decade the company has produced the show. Here’s a quick look at the Midsummer productions over the Public’s 55-year history of presenting free Shakespeare in the Park at the Delacorte Theater. Even though Joseph Papp began presenting the Bard’s work at the Delacorte in 1962, it took until the ‘80s to get Midsummer onstage. James Lapine directed the first Central Park iteration, which starred Christine Baranski and Deborah Rush as the lovesick Helena and Hermia. William Hurt played Oberon, and Marcell Rosenblatt played Puck in the tradition of a woman taking on the role. (Kristine Nielsen will don the sprite’s clothes this summer.) The production was filmed and aired later the same year on television. This summer, the deck is stacked for Lear deBessonet’s production of Midsummer. Annaleigh Ashford is making her Delacorte debut as Helena alongside Danny Burstein as Bottom, Phylicia Rashad as Titania, Kristine Nielsen as Puck, and many more. We can’t wait to see how set designer David Rockwell builds the realm of fairyland, and we’re ready to enjoy a moonlit night in the forest! Enter the mobile Lottery for a chance to win tix to A Midsummer Night’s Dream.